3. In a frying pan, sauté the onions and the optional Peperoncino Fiocchi (hot pepper flakes). 4. Add the zucchini and sun-dried tomatoes. 5. Spread the fried ingredients in the pan and pour the egg mixture on top evenly. 6. Add the goat cheese and some grated Pecorino Romano cheese. 7. Top with the zucchini blossoms and a bit more Pecorino Romano, cover and let cook for a minute or 2. 8. 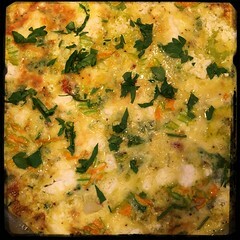 Place frittata in oven (on broil) and cook until top is golden!